Mom took me to see the Wal-Mart shrine in Bentonville when I went down there to visit her. The front of the five-and-ten-cent store where Bill Walton founded his empire has been preserved and, not surprisingly, just inside the front door there’s a little pretend store filled with old-timey nick-knacks you can pick up as a souvenir of your visit. The fake store out front is just the beginning, through. Stepping through it, we found ourselves in a museum devoted to the history of Wal-Mart. Mom pointed in awe at the maps posted along the walls that showed the number and location of Wal-Mart stores through the years with little clusters of dots that started in Arkansas and spread across the nation, looking not unlike botulism colonies spreading across a petri dish. I was more fascinated by the framed full-page newspaper ads. Did you know there was a time when you could buy a men’s button-down shirt for less than five bucks? 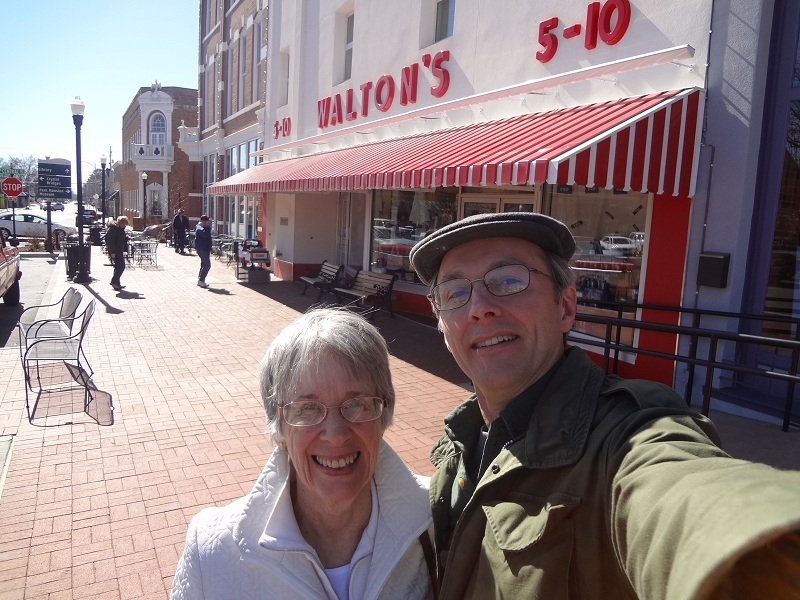 With Mom in front of the original Wal-Mart store in Bentonville, Arkansas. I flew down to Arkansas last weekend to visit Mom. I used a web service to book my flight because I know bugger-all about that sort of thing. For instance, I was naive enough to think that I could simply call the airline on the phone and ask them to book a flight for me. They’ll do that, but they’ll also charge twice what an on-line agency charges without mentioning that teensy tiny little factoid. I ended up booking a flight through a web service that helped me find the airport near the town where Mom lives. When I searched for flights into the nearest airport, it spat out a list of a couple dozen, showed how much they cost, where they had layovers and how long the flights took. Since the prices were all about the same, give or take ten dollars, I picked the ones that I would have to spend the shortest time on. The only way to fly is the quickest. I flew down to Arkansas on American Airlines. That flight went very well. We boarded on time, we arrived at O’Hare on time with more than an hour between flights so I didn’t have to run from one end of the airport to the other to catch my connecting flight, which also boarded and landed on time. I flew back from Arkansas on United Airlines. That flight did not go well AT ALL. I got to the airport an hour and a half before I was supposed to board, leaving me plenty of time for a proper Wisconsin good-bye. Mom and I hung out in the terminal lobby chatting for a solid twenty minutes before we hugged and kissed and then talked a little longer about the next time I’d visit. Then we chatted a bit longer about how nice it was to see one another again. Then one final good-bye before I climbed the stairs to the security checkpoint to take off my coat and shoes, everything but my pants, although that’s probably coming soon. After I was through the checkpoint and had put all my clothes back on, I consulted The Big Board to see which gate my flight was boarding at. The Big Board said Gate A6, so off I went. There were a few people already waiting when I got there but I snagged a seat near the desk, pulled out a book and settled in to read until they called for the first group. They usually start boarding about a half-hour before the scheduled takeoff time but not only was there no boarding announcement then, there was nobody at the desk, the screen behind the desk was dark and, most crucially, there was no plane at the gate. Felling a tad nervous, I strolled down the hall a ways to double-check The Big Board. My flight was still listed as being at Gate A6 and departing at ten-thirty, right on time. I went back to my seat and tried to read some more, but the persistent lack of anybody at the desk or any information appearing on the screen made me so uneasy that I couldn’t concentrate. I eventually gave up and put the book away. Fifteen minutes before my plane was supposed to leave, I still didn’t see an actual plane parked at the gate outside the window and there was still nobody at the desk to explain why. I went back to The Big Board: My flight was still scheduled to leave on time, still at Gate A6. Hmmm. There did seem to be a lot of activity at Gate A5, right next door, where four airline representatives were working at the desk. I didn’t want to bother them, though, because a long line of people were waiting to talk to them. At one point, one of the representatives got on the PA to tell the people in line that they were working as fast as they could to re-book everyone. When ten-thirty came and went without any further announcements, I went back to The Big Board one last time to check on the status of my flight. The Big Board said that it had departed. At that point I thought, To hell with worrying about bothering people. I stopped one of the representatives when she came over to A6 from A5 to use the computer. “Excuse me, is this where the flight to Chicago will be boarding?” I asked, showing her my boarding pass. “No, this is Houston,” she answered, glancing at my pass. “Chicago’s over there.” And she pointed at A5, where the long line of people where waiting. Oh. Okay. Thanks for announcing that. Good thing I didn’t need to ask. I went next door to Gate A5 and, flashing my boarding pass, asked the woman behind the counter if this would in fact be the gate where the flight to Madison would be boarding. She said yes, it would, so I stood to one side while she fiddled with the computer while answering questions from a bunch of other people. She looked at my boarding pass, then at her computer, and then she picked up the microphone again and announced that the flight to Madison – and here she said my flight number this time – would begin boarding. We took off forty-five minutes later than we were supposed to, yet somehow we arrived in Chicago only twenty minutes late. I’m not sure how they pulled that off, but I’m not going to complain about that, especially considering what happened next. The flight pulled up at Terminal F. I went straight off the plane up to The Big Board to find where my connecting flight was supposed to board. It said F12, right down the hall, but when I got there the screen behind the desk said that the flight was going to Frankfort, Kentucky, so once again I held out my boarding pass and asked the guy behind the counter where I could find the flight to Madison. Oh! Hello! We have a comedian! Very funny! Hah! Hah! Hah! “Right over there,” he said, pointing to the next gate over. Sweet Jesus Christ on a bicycle. So, with less than twenty minutes to spare, thanks to the comedian, I had to run from Terminal F to Terminal B. I’m pretty sure they’re in separate counties because I barely arrived on time to catch my connecting flight to Madison, a flight so short that they didn’t serve drinks or I would have bought at least two and as many as six before getting into a fight with a flight attendant and ending up being led off the tarmac in handcuffs, so maybe that’s the one thing that went right on that whole trip. I took a little trip this weekend to visit with Mom. As she lives in Arkansas, I had to choose between driving or flying. I’d rather be the subject of almost any kind of invasive strip search than be cooped up in a car for twelve hours, so I chose to fly. And regretted it almost right off the bat, as I lined up behind a guy in the TSA strip-search-a-thon who decided to make a federal case right then and there about his rights. Buddy, I wanted to say, unless and until you get to the end of this line, you have no rights, and I’m stuck behind you, so can we please move this along? But no, he wanted to argue his case. I never thought I’d be grateful to see someone pulled out of a line for special treatment by the TSA, but I was. The flight was uneventful, which is about as good as commercial flying gets, although it almost got better when the steward announced there were complementary cocktails for military personnel. I had my military ID out and was ready to flash it when she finally rolled the cart up to my aisle, but it turned out the offer was only good for uniformed personnel. 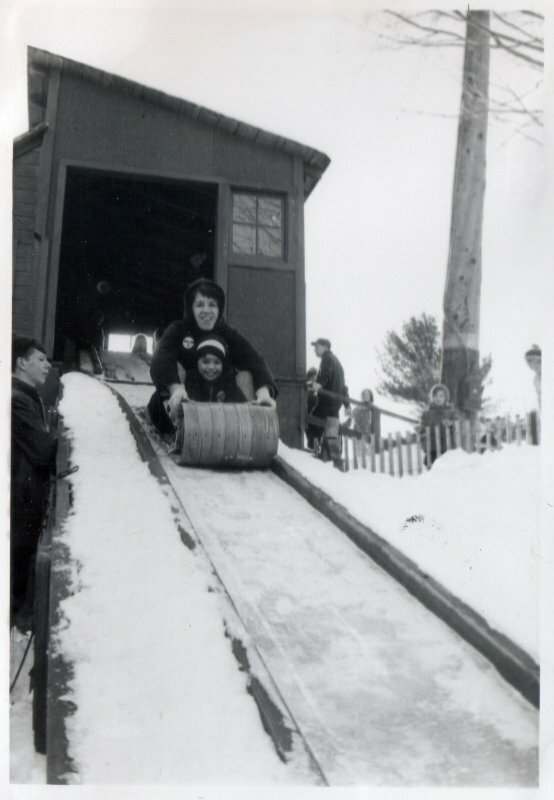 Even though I happened to be wearing my fatigue jacket, I didn’t argue the point, and just ponied up the six bucks for my tiny little bottle of Tanquerey and a can of tonic. We landed after dark, so I didn’t get a chance to look much at the area as we descended. I found Mom waiting for me near the entrance of the terminal and, after making our hellos, we were on our way.